Recycling old blog posts is a great way to come up with new posts. But what if you want to explore something else. Or you’ve reworked all of your old posts? Don’t fret – you’ve still got plenty of options. It may sound obvious, but stay informed. Read magazines, newspapers, books, websites of all kinds. Sometimes inspiration comes from reading something that seems completely unexpected. Is there something that clients regularly ask you about? Write your answer and explanation in a post. Don’t shy away from a topic that is industry related, yet controversial. You might choose to take a neutral stance, offering up all positions and viewpoints, or, if you are comfortable, go ahead and write up your own well-thought-out stance on the topic. Pay attention to your social media accounts. What are others talking about? What questions are people asking? What are they looking for? 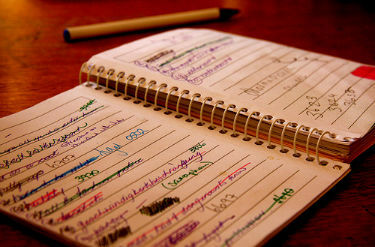 Always keep a notepad or voice recorder close by to jot down ideas and thoughts or to journal. I can’t begin to count the number of fabulous blog posts I’ve come up with while in the shower, only to forget them by the time I was done. You never know when an awesome blog post will form in your mind. Where do you see your industry headed in the next 5, 10, 40 years? How is it different from 5, 10, 40 years ago? Reflect on trends and speculate on what lies ahead. Know of a good topic already, but don’t feel comfortable writing on it yourself? Ask someone to guest post, or interview them and write up your Q & A session. Worst case scenario (or maybe, it’s the best place to start? ): take a walk, go for a run, drive through the countryside. Just step away from the computer and allow your mind to relax.